It isn’t often that you find yourself climbing a mountain by mistake. Or at least, hopefully, it isn’t. Then again, if we take ‘climbing a mountain by mistake’ as a metaphor for life, it might feel like something that happens with all too frequent a sense of regularity when we reflect on the thankless struggles we tackle in our everyday lives. But this really is the story of climbing a real mountain … by mistake. I was in South Korea. And oddly, although perhaps appropriately enough I can no longer recall the name of the mountain. It wasn’t far outside Seoul. Somewhere in the Bukhan-san National Park. Looking at my well-thumbed guidebook there are a number of peaks and rocky knolls there, but I suspect it was Dobong-san (739.5 m / 2,426 ft). Neither I nor the friend I made the impromptu trek with took very many photos that day, and I made very few notes on this particular trip to Korea, so I’ve little to go on besides my hazy memories of it. The trek itself has since formed itself into an odd little footnote to a trip of far more remarkable events besides; hence why its memory has probably since been almost entirely eclipsed. We had only been in Korea for a day or so. We were there to work on an exhibition at the National Museum of Korea. When we landed in Seoul we were met with the odd news that whilst we’d been airborne a seemingly unpronounceable volcano (Eyjafjallajökull) in Iceland had erupted and so all subsequent flights across Europe had been indefinitely grounded, thereby delaying our colleagues who were meant to be following us escorting a second shipment of artworks. The distinctly distant and vaguely surreal reality of this situation was added to by the fact that of more local concern the TV news bulletins in Seoul were nervously preoccupied by the fact that only a few days before a South Korean naval corvette, the Cheonan, had sunk in mysterious circumstances off the coast not so far away from the city, sadly with the loss of many young servicemen’s lives. Each morning I watched the TV news reports as day-by-day it slowly seemed to become clearer that the incident was an unprovoked suspected North Korean torpedo attack. Several large white tents were set up as a temporary memorial near to our hotel in which serried ranks of portraits of those sailors who had died were displayed on altars, and a state of national mourning was declared. There was a distinct air of uncertainty as to what, if anything might happen next on either side of the DMZ as a consequence of this incident; but there was also a very real sense in Seoul that normal life should go on unchanged. Hence perhaps why somewhat bizarrely we took advantage of the following free day to visit the DMZ itself (which you can read more about here), hoping we wouldn’t find any ‘unexpected visitors’ approaching from the other side. Later on, whilst working on the exhibition, we got to know the (then) British Ambassador to Korea, who told us he and his staff had contingency plans in place to evacuate British nationals if things came to a head; I half-jokingly asked him if he had room on board for some of the more famous artworks we’d brought with us to Seoul. Happily it never came to pass; plus the skies over Europe eventually cleared from the fallout of volcanic ash, but the late arrival of our second shipment meant we had to work long and late, thereby very sadly missing our invitation to drinks (and presumably an unlimited flow of Ferrero Rocher chocolates) at the Embassy. 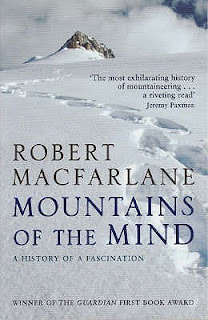 I was recently put in mind of this long forgotten, impromptu trek up a small Korean mountain by reading Robert Macfarlane’s excellent book, Mountains of the Mind (Granta, 2003), which is subtitled ‘the history of a fascination.’ As anyone who regularly reads ‘Waymarks’ will be well aware, I too have a fascination for the history of exploration – and whilst the Himalaya definitely forms a key focus to my fascination (indeed, whilst researching in the Foreign Office archives I couldn’t help becoming side-tracked by papers relating to the 1921 and 1922 expeditions to Everest, and later I was fortunate enough to meet the family of George Mallory, to whom Macfarlane devotes a chapter of his beautifully evocative book), I tend to shy away from the colder extremes of actual mountain tops and the polar regions. I’ve never been tempted to try proper mountaineering for myself, but when I was younger, holidaying in Cornwall each summer, I used to delight in nimbly scaling down steep rocky cliffs to reach secluded beaches with my family. Vertigo was never a problem for me until much later on in life, when now it has the ability to flush my palms cold and turn my legs to jelly at the most unexpected of moments as I discovered when travelling in the Tibetan foothills of West China. But my first flinch may have inadvertently occurred on this little trek in Korea earlier that same year. We had taken the train out to Bukhan-san from Seoul. I can’t recall where we got off, but now looking at a map either Dongbong-san or Mangwol-sa Stations seem the most likely. It was still cold and very wintery weather, so we were wrapped up warm; but neither of us was wearing the right kind of footwear for what was ahead mainly because we had no real idea of where we were heading. I was wearing plimsoll-like shoes with completely smooth soles, my friend’s shoes were much the same. Exiting the station amidst a swarm of senior citizens we found rows of market stalls all set out and groaning beneath piles of outdoor trekking gear. Everything you could possibly imagine, from Goretex jackets and thermal-mesh balaclavas to bionic-looking boots with cramp-ons and graphite extendable walking poles. Most of the gear was the real deal, all fancy labels and equally fancy price tags attached. We joked to ourselves at what we took to be the overly fashion-conscious seriousness with which everyone here seemed to take in simply going for a little walk in the countryside. I’d had a taste of the Korean outdoorsy-type a few years before on a trip to Dajeon further south. It seems to be a pastime here mostly for those well past retirement age, and one which is very much focussed on personal fitness rather than a relaxing engagement with nature. We were soon stunned, however, as we progressed into the Park as the trail was filled with old folk all hyper-energetically ‘speed-walking’ their way along the tracks gently winding through the woods, heading uphill. They were clearly far fitter than we were. We rather hoped their numbers would thin out a bit as we got higher up, but if anything the paths got increasingly congested. At certain narrow points people politely queued and then alternated to let those ascending pass up and those descending pass down. Everyone seemed very well mannered and in good cheer, although clearly all were bemused to see two scruffy and ill-attired foreigners wheezing up the path – we felt sure most of the loud chatter passing up and down the line was about us and certainly the ripples of humour were clearly at our expense. Given how crowded the ascent became we had little choice in places but to keep moving, such was the insistent press of people behind us. The sense of politeness seemed to give way as we felt increasingly jostled not to hold the line up. Our own jocular hilarity quickly waned, but by now we found it was too late – we’d crossed a Rubicon of sorts. Seeing men in full climbing gear with ropes coiled over their shoulders descending from the route we were heading up didn’t exactly fill me with reassurance. We were now being urged up steep smooth rock surfaces into which steel ropes had been anchored. The twisted metal wires were polished and icy cold such that it was better to remove our gloves in order to get a workable grip on them. Panting like a pair of mad dogs we clambered on until all of a sudden we startlingly found ourselves perched on a narrow pinnacle of rock – we’d “summited”; but here too there was no relenting. The push of people rising from behind forced a tight circumambulation on the sixpence of the rock. I forced myself onto a higher patch where I half sat / half clung, and remained resolutely immoveable as I tried to get my breath back in the cold, clear air. My bulky city clothes and my bald shoe soles had made that climb twice as hair-raisingly perilous as the claustrophobic peer-pressure around me had made it feel fraught. “That was simultaneously surreal and insane,” I said to my friend. Beneath us, across a vista of bulbous rocks and spiky pine trees, in that magical light which seems to characterise the “Land of Morning Calm,” we could see the vast city we’d left behind. Or at least, all the buildings, the roads and the subway lines, all the empty cars and empty trains, for it felt like all the inhabitants of Seoul had accompanied us on this little trek. There was no chance of feeling lonely up there on that ridiculously small rock. On our way back down we spied a tiny little trail leading off the main track. It seemed like nothing more than an animal track through the undergrowth but we both decided we’d follow it. We were desperate to escape the mobile metropolitan crowds. All through the forest we could hear the echoes of their incessant chatter, some were even carrying portable radios which were loudly blaring out tinny tunes as they trekked. As we skittered down our makeshift path the ground underfoot began to get boggier. As we progressed we came to realise our little ‘path’ was in fact a frozen streambed. We dropped into a sheltered hollow which would probably become a small waterfall in the coming summer months; here we sat ourselves down on a mossy rock and reflected on our climb and just how different a mindset these Korean trekkers seemed to have to our own. There seemed no sense of awe or appreciation, nor even a simple awareness of the natural world around them. A complete collective disregard for stillness and tranquillity reigned. Except for a couple of selfies rapidly snapped at the top no one seemed to be particularly interested in the view or the wildlife. We’d not seen a single pair of binoculars – and neither had we seen a single wild animal, not even a solitary bird. It was little wonder with all the noise and bustle, with all the clamour to conquer the adversities of the landscape and defy the unstoppable advance of age and time. If life is a metaphorically unexpected mountain clearly you have to prepare and kit yourself out to climb it successfully. But, that said, one should never underestimate the mad, misguided sense of satisfaction that can be derived from unwittingly setting about it in your bald soled shoes – and living to tell the tale!